This easy seafood casserole recipe is one of my most requested family favorite recipes. We don’t splurge on seafood all that often because it’s rather expensive here in Vermont. During Lent, I make it at least once or twice because I run out of ideas for dinner. Most of the time, tuna or some other type of fish is what I choose because it’s more affordable, but sometimes you just need something a little bit more special. This recipe was originally posted in here in 2012 but I decided to re-do the photographs and share it again in case you missed it the first time. I shared the recipe with you originally as part of a cookbook review when I received the 300 Best Casserole Recipes . The cookbook is still in print and available in stores so if your family loves casseroles, you should definitely check it out. This easy seafood casserole recipe takes about an hour to prepare from start to finish. It’s got a rich, creamy sauce and is topped with cheese. I used broad egg noodles in the casserole, but I’ll be trying it again with Conchiglie (sea shells) which is my husband’s favorite type of pasta. I used frozen Bay scallops and frozen shrimp but you could substitute whatever type of seafood you have in your area. If you’re gluten intolerant, substitute a gluten free pasta and gluten free flour . I baked it in a cast iron skillet because everything is better in cast iron. If you’re not a fan of mushrooms, you can add peas or chopped broccoli instead. What additions you want to add are entirely up to you and what your family loves to eat. Or, it’s up to what you have in the freezer which is what happens quite a bit in our house. This really is one of our favorite seafood casserole recipes. This easy seafood casserole recipe is a family favorite. In a large pot of boiling water, cook noodles according to package directions until just tender. Drain and transfer to 12 cup casserole dish. Meanwhile, in a large skillet, melt 2 tbsp of butter over medium-high heat. Saute mushrooms for 5 to 7 minutes or until tender. Spread over noodles, along with shrimp and scallops. In a small sauce pan, melt remaining butter over medium heat. Whisk in flour, salt and pepper. Cook, stirring constantly for about 2 minutes or until smooth. Gradually whisk in milk and cook, stirring constantly, until thickened. Pour over noodle mixture and sprinkle with cheese. Cover and bake in preheated (350F) oven for 40 to 45 minutes or until hot and bubbly. Remove from oven and preheat broiler. Uncover casserole, sprinkle with paprika and broil for 3 to 5 minutes or until top is golden brown. Ummm,...Yummm. We must have similar taste budsy. Your recipes always appeal to me on every level. I love seafood and anything with cheddar cheese looks good to me! Thanks for the recipe! I love the combination of the seafood and cheese. Please share this on my foodie friday linky today. You never said at what temperature the oven is to be preheated too????? Thanks for the fast reply!!!!!!!! You are to be commended for paying attention to your blog and questions that we may have!!!! Glad to help. Hope you enjoy it! Any dish with seafood always makes an awesome meal; I just love this seafood casserole. Thank you so much, Aaron. *drool* This looks delicious! 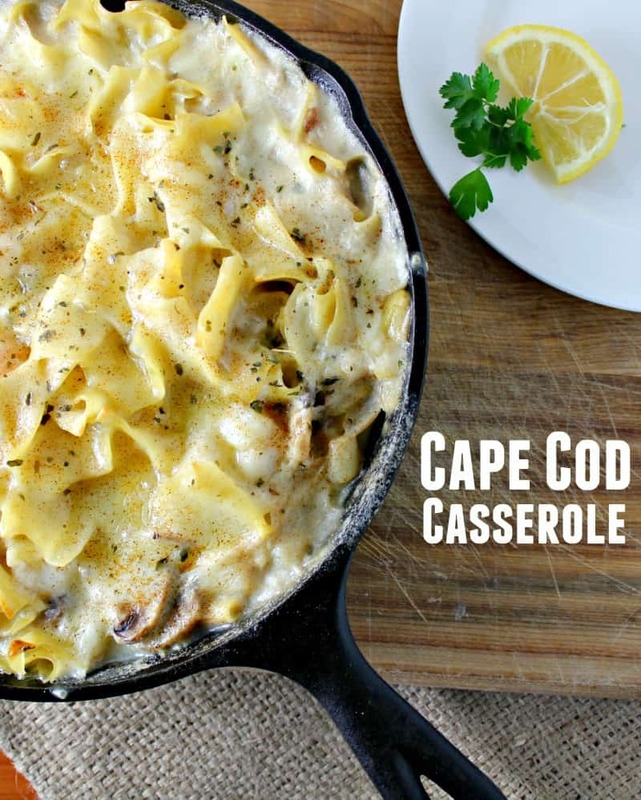 My hubz is not a huge seafood lover like I am, but this one looks like pure comfort food!